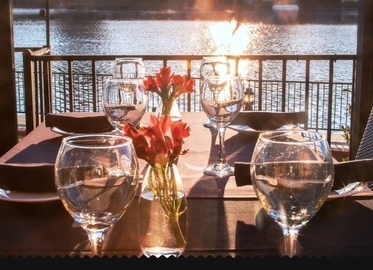 Zin Bistro Americana on Westlake Lake! $64 for $100 Worth of Dinner and Drinks or $32 for $50 Worth of Dinner and Drinks. May Purchase Multiple Certificates! Extensive menu incorporating "nostalgic cuisine" and a "synergy of cultural flavors"
How is it that Zin Bistro Americana landed a view that is the envy of every restaurant in the Conejo Valley and created a menu diverse enough to satisfy the entire Conejo Deals Team! “Comfort” food includes a delicious Main Lobster Ravioli, Shrimp Scampi, and Spaghetti Bolognese. The “Surf” menu features an incredible Cioppino, Parmesan Crusted Sand Dabs, and a Macadamia Crusted Halibut. See you at Zin Bistro Americana at the Lake! P.S. Want to score a couple of certiifcates for yourself and a few more to give as gifts? Why not? The price you paid does not appear on our certificates!